UPDATED: Sun., Dec. 3, 2017, 10:01 p.m. The Philadelphia Eagles found out Sunday night in Seattle that Omar Little was right. The upstart Eagles, who fancy themselves as kings of the NFC this season, missed Russell Wilson often enough at CenturyLink that the Seahawks escaped with a 24-10 win. But doesn’t everyone miss Wilson at least two or three times every game? The win allowed the 8-4 Seahawks to stay within a game of this year’s NFC West kings – for now – the Los Angeles Rams, as the division title seems destined to come down to the wire. 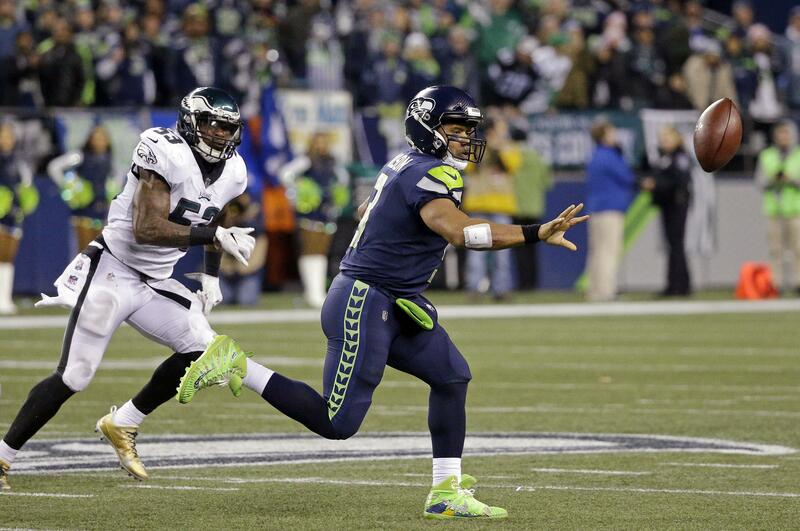 If you didn’t think this game was important for the 8-4 Seahawks, then you didn’t see the game’s first play. Wilson, responsible for about 120 percent, more or less, of the Hawks’ offensive output this season, faked a run to Mike Davis and kept the ball. Nothing out of the ordinary about that. But it wasn’t a zone read or a scramble. It was a sweep, more or less, with a lead blocker. Something out of the 1950s. And a play that puts your best offensive player in harm’s way. That’s how important this game was to the Hawks. The play went for 7 yards, part of a 12-play, 53-yard drive that resulted in a Blair Walsh field goal. And it set a tone. Seattle is a great place to play a night game. The atmosphere is electric. The mood joyful. And someone like Chris Pratt is always available to raise the 12th-man flag. It doesn’t hurt that the place has some history, from the many Seahawks victories to the Fail Mary call to the explosive second half earlier this season against Indianapolis. So it’s no wonder this one included some fireworks as well. In the first five minutes of the fourth quarter, there were three explosions, two of them courtesy of visiting quarterback Carson Wentz. The first was almost unbelievable. On a third-and-13 at his 16-yard line, Wentz rolled right, stumbled and was grabbed from behind by Quintin Jefferson. While going to the ground he threw the ball more than 40 yards in the air, connecting with Nelson Agholor for a 51-yard gain. Three plays later he rolled right again and, under less pressure, threw all the way across to the field to Agholor for a 27-yard score that pulled Philadelphia within 17-10. It was third-and-14 and Byron Maxwell, playing because of the Richard Sherman injury, was victimized both times. But Wilson seemed to see the plays as a can-you-top-this challenge. On the ensuing Seattle drive he faced a third-and-8 at his 42. He dropped back, saw nothing and took off. There was no way he was making the needed yardage so, after about 6 yards, he flipped the ball to his right. Wilson got crunched. But the ball was already gone. Davis had it and had 17 yards of open space ahead. First down and, four plays later, the clinching touchdown. Only in Seattle. And after dark. Wilson was his typical – for this season – efficient self, completing 20 of 31 passes for 227 yards. Fine numbers, but nothing spectacular. Except he also threw for three touchdowns, avoided about 50 yards in sacks and directed an offense that didn’t turn the ball over. And he added 31 yards rushing. Wentz, who many east of the Ohio River see as the next big thing, had bigger numbers – and the one incredible play to start the fourth quarter – but also made more mistakes. His 29-of-45 passing accounted for 348 yards and one touchdown. But there was the matter of the late interception. And the game’s most crucial turnover, his fumble at the Seahawks’ 1-yard line on the second half’s first drive. The Eagles (10-2) had a shot at tying the game and wresting the momentum. Instead the ball went out of the end zone, Wilson led the Hawks on an 11-play, 80-yard scoring drive, culminating in his 1-yard throw to Tyler Lockett. From then on out, the Eagles were playing catch-up, a game they couldn’t win. Published: Dec. 3, 2017, 8:57 p.m. Updated: Dec. 3, 2017, 10:01 p.m.